"I dislike Abe. He's covering up history," these were the clearest and most accurately pronounced words amid the sporadic Chinese Tamaki Matsuoka said that afternoon. The 69-year-old Japanese woman, a former primary school teacher, remembers when she first started teaching history. She discovered that there were barely any descriptions about the Nanjing Massacre and Sino-Japanese War, and so when her students asked her about them she felt woefully underprepared. A history major from Kansai University, Matsuoka said that she and her classmates knew about the Nanjing Massacre and Sino-Japanese War but the specific details were not taught. "I wasn't able to teach my students this way, especially when they asked me what I knew about the war. So I made up my mind to collect more historical information," Matsuoka recalled. To get to the truth, Matsuoka has visited Nanjing more than 90 times since 1988, seeking out victims and recording their stories. After nine years, she felt it was time to speak to Japanese veterans of the war so she could get both sides of the story. One after another, she interviewed more than 300 victims and 250 former soldiers. "The more you know, the more you question, and the more you want to know," Matsuoka said. Over the years Matsuoka has produced books and a documentary film to present her findings. 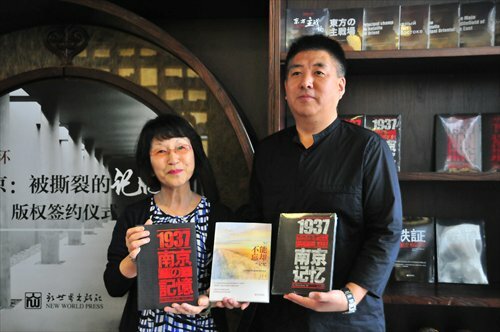 Her latest book, Torn Memories of Nanking hit Canadian shelves in April, becoming a hot-button topic in social spheres. A Chinese version is on the way, according to New World Press. After a copyright signing ceremony for this Chinese version held on Friday in Beijing, the Global Times sat down with Matsuoka for an interview speaking through an interpreter. Q: How did victims react when you, a Japanese person, asked for an interview? Was anyone unwilling to talk to you? A: Yes, but just a few. Some of them were uncomfortable when they saw I was Japanese and refused to talk at first, but I managed to persuade them to say a bit. My interpreter also helped explain how I want to tell Japanese the real history of the war. Once they started to talk, they usually couldn't stop. Q: Was there anyone unwilling to recall the past? A: It seemed the soldiers were more unwilling to talk about the past than the victims. Chinese interviewees might think I can convey their suffering and anger toward Japan, so they are more willing to talk. Q: When you visited those Japanese veterans, how many of them regretted their actions? Could you give me an exact number or ratio? A: Really only few, about 2 to 3 percent, or 3 or 4 people out of 250. Q: So what were the attitudes of the rest? Pride? Indifference? A: Although veterans know what they did in Nanjing, it's not talked about in Japan. It's a taboo topic related to a political issue. Some did, however, admit to me how many they killed in Nanjing. Q: What was the reasoning for their actions? A: They were taught in the military to obey commands without question. So first, they thought what they did was an unavoidable part of war and second some felt they were just following orders. Some felt uncomfortable after the massacre, but they comforted themselves with these thoughts. Many veterans took back things they stole in China back home, but told their family members they treated the Chinese well and that the Chinese people were also friendly to them. During interviews, I described scenes of shootings and how Chinese civilians fell down to the ground and some of them gradually remembered and realized what they did was bad. Q: Did anybody try and stop your work? A: Every year starting from 1997, I would invite a group of victims to attend one of my lectures in Japan. Every time right-wingers would drive around the site of the event and shout through a loud speaker that the Nanjing Massacre never happened and that I was telling lies. They have also called my school and told the principal he was employing a liar. Q: Have you ever received any support in Japan? A: A little from civilian movements. Those who desire true history and support Sino-Japanese friendship buy my books. Some donate money at my lectures. Nearly 700 people showed up at the premiere of my documentary and I was very pleased when they made donations. Q: What about from China? Have you received any help from that side? A: Well…I can't accept any support from China. That will give the right-wingers something to use against me. But to be honest, I do need money even though I can't always take it. Q: What are some of the biggest differences between what's in your research and what Japanese history textbooks present? A: The core problem with Japanese textbooks is they adopt a vague attitude, such as having a brief introduction only one or two lines long. Twenty years ago, textbooks talked about issues concerning forced labor and "comfort women," but now they do not. Abe and his Liberal Democratic Party have made this period of history increasingly vague. In the 1970s, Honda Katsuichi, then a journalist working for the Asahi Shimbun newspaper, published a best-seller that unveiled the truth of the Nanjing Massacre. From then on, right-wing parties have become increasingly strict about the issue.